Breasts are trouble. Legs are easy. 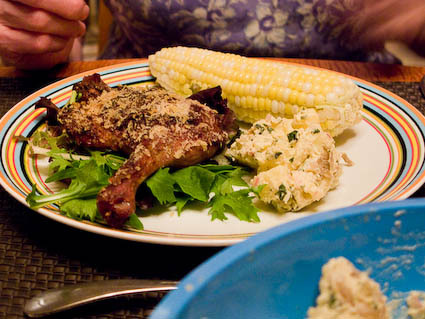 One of the first serious dinner parties my consort and I ever gave was a duck debacle — I picked a ridiculously ambitious recipe from “Cooking With the New American Chefs” involving fried corn cakes and pinot noir sauce, and the two of us managed to put together what Bob said “looks like farmer food.” Tears were involved. Not to mention mangled breasts to the then-crazy tune of 30 dollars. That was two kitchens and two Siamese ago. Saturday night we had a couple of friends over for duck, but it was duck without the hysteria. I just did the legs, which really are the best part of the bird. And I did what Bob calls upscale Shake N Bake. We eat this at least once a week by ourselves, but I serve it probably way too often to guests. More than once we have all sat down and I realize: This is exactly what I made last time they were here, right down to the sides. No one has ever complained, though. The meat is almost as tender as duck confit, and the skin is even crispier. With food, that old saying about good artists borrowing and great artists stealing is especially true. Almost nothing is completely original. I first swiped this one (with attribution) from Madeleine Kamman’s excellent “In Madeleine’s Kitchen” but gradually made it my own. Basically you season the legs on the meat side with salt and pepper, smear the skin side with Dijon mustard, sprinkle with panko and drizzle with melted butter, then stick them in the oven at 325 degrees for an hour and a half to two hours. What could be easier? Not bothering with the sauce she makes from the pan drippings, apple cider and veal stock — homemade, of course. If I have time, though, I cure the legs before roasting them, as you would for confit. It’s like brining a turkey but with no water, just salt, sugar, pepper and herbs/spices (thyme or herbes de Provence and a little allspice) rubbed on both skin and meat and left in the refrigerator for a couple of hours or overnight. The meat gets super-tender and has even more flavor. (You rinse off the rub before cooking, of course.) Sometimes I lay a couple of garlic cloves under or around each leg in the roasting pan, too. It’s one of those sensations you make over and over and never exactly the same way. We stock up on legs from Quattros at the Union Square Greenmarket on Saturdays; they sell both muscovy and Pekin but the latter are much better for this. (You can also find them at Fairway and some butchers and in Chinatown, but these are the best, fresh and meaty. Six legs cost $19.25 on Saturday.) And we always have enough for a party in the freezer. I shouldn’t admit this, but we sometimes thaw them in a bowl of water in an emergency. 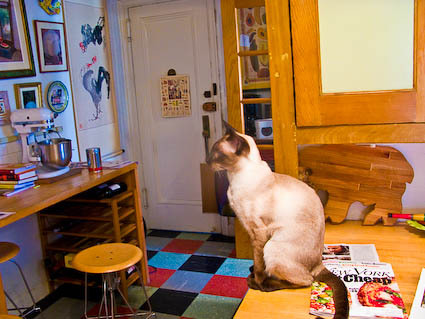 And I really shouldn’t admit this, but The Cat Who Came to Live With a Food Writer has been known to abscond with one in his saber teeth. 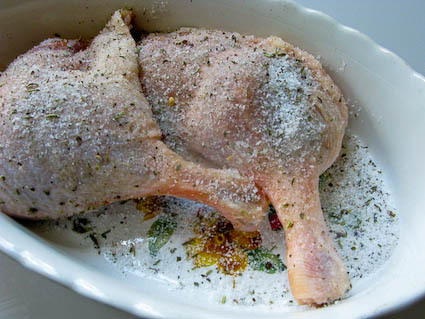 Since the duck debacle, though, we’ve learned the best rule for dinner parties: First you marinate the guests. They’ll be mellow with everything, and it buys time in case the duck isn’t done when you expect (the longer it cooks, the more tender it gets). Plus the conversation is more raucous once you settle in at the table. Saturday our friend Dr. Bugs wanted us and our friend Joanne Singer to help him choose a title for the book on ants he’s just finishing (for some reason he didn’t like my idea of “No Picnic”). So we voted in the kitchen while eating the appetizer I threw together: slivered grape tomatoes (a k a Wyl-E’s toys) with chopped basil and grated fresh mozzarella, spread on baguette slices and toasted in the oven till the cheese melted. Only when the corn was steaming did we remember the peach ice cream Bob had mixed but not frozen, but we have this amazing Donvier that does the job in literally minutes. (Well, Joanne did the job of turning the crank.) We had that with blueberries, also from Union Square. I only tack that drivel on because it makes me realize that what made this meal so easy, yet again, is that it really didn’t rely on recipes. I dredged up one for the potato salad dressing because I got a (bungled) Epi-Log post out of it, and we checked the Donvier pamphlet for the precise proportions for the ice cream. But cooking, especially for company, is so much easier when you do it just by feel. It’s what makes Thanksgiving the simplest dinner of the whole year for me. 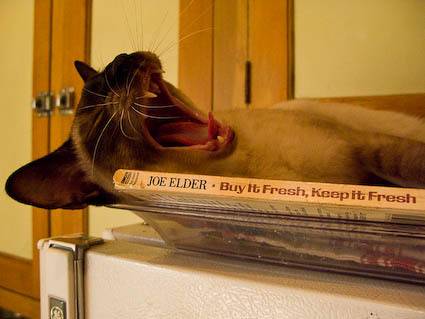 Cookbooks can be like begging for trouble. So, I have to acknowledge, is trying to blog naturally on someone else’s intimidating stage. Big thanks to Adam for loaning me his keys and trusting me not to trash the joint.